Why does growing radishes give me so much trouble? Children grow radishes, for heaven's sake. They're the sort of crop you just drop in the ground to pop up quickly while everything else takes its time. 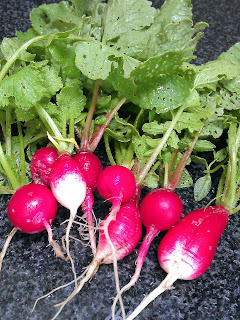 Radishes are known as an catch crop or a marker crop, the latter especially with parsnips which can be slow and erratic. The faster-growing row of radishes 'marks' the row of parsnips, helps to keep it weed-free and - in theory - provides a quick harvest while the parsnips are still pondering germination. And yet they give me endless trouble. They don't like my clay soil for a start and would prefer something more sandy and freer-draining. Their leaves are pockmarked by flea beetle: by the time I harvest the effect is like delicate lacework. The slightest check in growth and off they bolt, leaving a thick stem with a woody stub of a radish at the end of it. Last month's spell of fine dry weather following the record-breaking wet April is a good case in point and I'm writing this after coming in from lifting a good three quarters of the first radish sowing - all bolted. 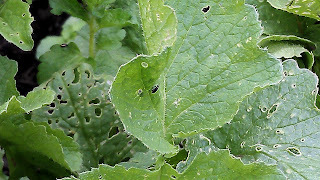 Radish leaves reduced to holes, complete with flea beetle - in the centre of the picture. I usually make three radish sowings: in March in a sheltered raised bed. I get to March and I long to be able to put something in the ground and radishes seem to fit the bill. The second sowing in April are the parsnip marker rows. Hearteningly, this year's April sowing is shaping up quite well, especially welcome after losing so many of the first lot. The third set, in May, is always totally hit and miss. Mostly miss. And yet I will persevere with radishes. Partly because, yes, they are quick to mature. If they're going to fail, they fail quickly and I don't feel I have invested too much time and space and hope on them. And partly because the ones that do slip through the net are well worth it. Home-grown radishes have a much stronger, more well-rounded flavour making shop-bought ones bland in comparison. They're so attractive on the plate - I always get a delicious sense of anticipation from a dish of ruby and crimson radishes. I've tried white varieties such as Ping Pong and the Polish yellow radish Zlata without much success: alongside the standard French Breakfast, I would rate Scarlet Globe and Amethyst the highest, although Amethyst is a bit of a bolter. All these three have a strong clean flavour, plenty of crunch and that all-important peppery kick to the taste. The leaves may be beetle-bitten, but these radishes are still good to eat, if a bit misshapen.